Hello everyone, time is flying and Easter is just around the corner! 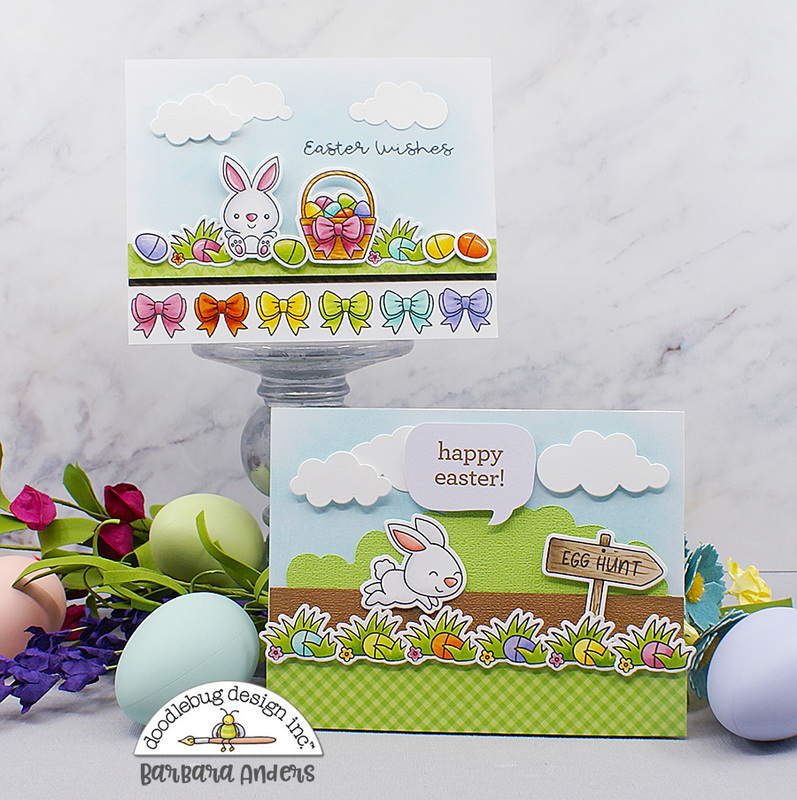 I have a couple of cards today using the new Hoppy Easter Doodle Stamps and Doodle Cut dies. For my first card, I created a scene with a hopping bunny. 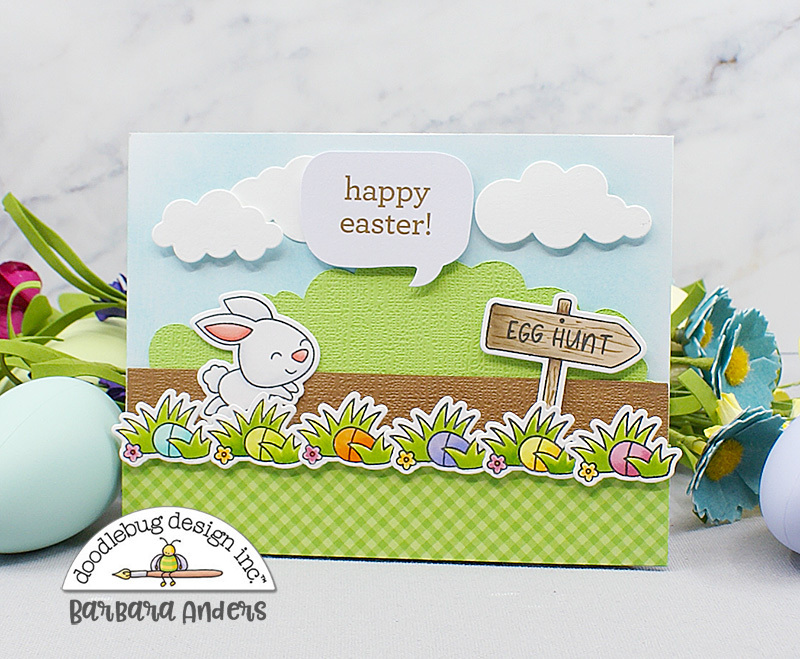 Yes, this bunny is "hopping down the bunny trail" hunting Easter eggs. I sponged the sky with ink and added some background greenery cut with a cloud cut file and Citrus Textured Card Stock. Next I added the "trail" made from Bon Bon Textured Card Stock, and the foreground from the Gingham-Linen Rainbow Petite Print collection with a couple of layers of card stock behind it for strength since it was adhered with foam tape. How cute is that??? When that was done and working I added some clouds and the sentiment speech bubble from Hoppy Easter Odds & Ends. Once all that was done I adhered the whole thing to a white card stock base for the finish. 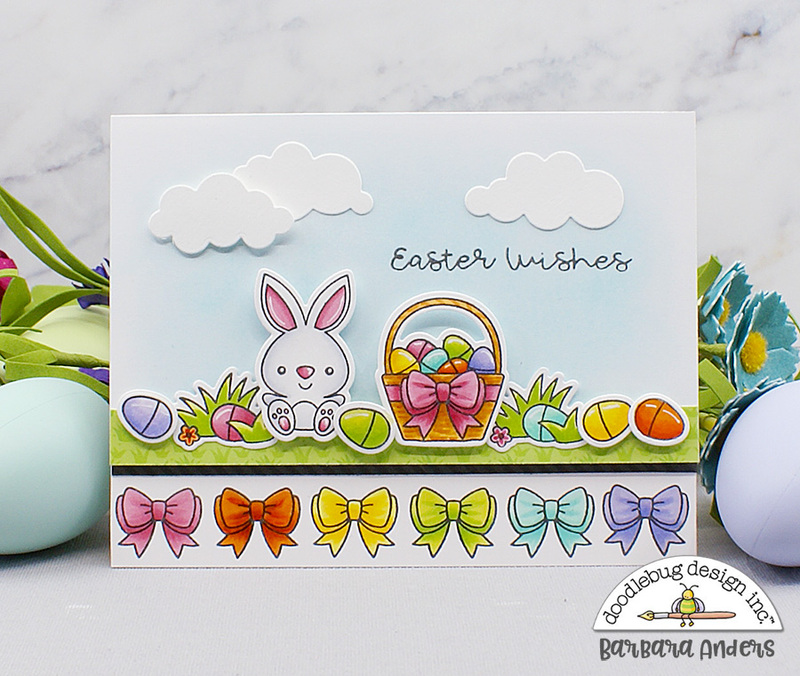 My second card shows another sweet scene--these bunnies are adorable! Again, I started with a sponged sky then added a strip of paper from the 6 x 6 Hoppy Easter Paper Pad for the card front.Then, I stamped the bows in a row with Copic-friendly ink, colored them in rainbow colors and adhered it to the bottom of a white card stock base. Next I stamped, cut, and colored the super sweet images and stamped the sentiment on the card front. I adhered that to the base with foam tape and a narrow strip of Beetle Black Dot-Stripe Petite Prints paper, did the same with the colored images, and added a few clouds to complete the scene. Thanks so much for stopping by today! I hope you've gotten a few ideas for using YOUR Hoppy Easter Doodle Stamps and Doodle Cuts! Absolutely beautiful cards!! Love the little hopping bunny! ADORABLE! Amazing let me tell you, stamp and die sets by Doodlebug is my Dream Come True!! !